The Centre for Biotechnology and Bioinformatics (CEBIB) in collaboration with industry partner, Inqaba Biotec-East Africa Limited (IBEA Ltd), has organized a 4-day workshop on Introduction to Phylogenetics. The course scheduled between 24th - 27th October, 2016 will be hosted at CEBIB Bioinformatics Laboratory based at the College of Biological and Physical Sciences – Chiromo Campus, University of Nairobi. Five CEBIB students attended the 5th Annual Biosafety Pre-Conference Training at the Kenya School of Monetary Studies (KSMS), Nairobi Kenya on 15-16 August, 2016. The students are: Elizabeth Amady, Henry Ondabu, Patrick Apando, Betty Kerubo and Collins Owino. The theme of the conference was: “Strengthening global, regional, national collaboration partnerships and capacity towards meeting international obligations in Biosafety.” It was organized by the National Biosafety Authority (NBA), Kenya. On July 8, 2016, CEBIB staff and students were trained on how to operate a newly acquired Veriti Thermal Cycler (96 X 0.2ml block) at CEBIB Electrophoresis and Proteins Chemistry Lab. The training was facilitated by Ms. Esther Kiragu, Field Application Specialist from Africa Biosystem Limited. On July 4, 2016; Dr. Fanuel Muindi, the Assistant Director of Graduate Studies in the Department of Molecular and Cellular Biology, Harvard University visited CEBIB. The objective of Dr. Muindi’s visit was to discuss with the faculty staff on possibilities of collaborative research and to learn more about academic programs offered at the Centre. He also had a meeting with postgraduate students from CEBIB & SBS. He highlighted on the available fully-funded PhD programs at MCB, Harvard University. CEBIB Students participate in Molecular Epidemiology Workshop hosted at CAVS, Kabete Campus on 8th & 14th June, 2016. The 2-days Workshop focused on principles of molecular epidemiology, criteria for selection of genotyping methods for epidemiology and highlights of core molecular methods. The guest speaker Prof. Wondwossen A. Gebreyes - Director of Global Health/Professor of Molecular Epidemiology - Ohio State University also engaged the participants in discussions on genotypic approaches used in epidemiologic investigation of pathogen in human, animal and environment interface (vector-borne, foodborne and other zoonotic diseases). The Director, Dr. George Obiero, holds an open door policy to CEBIB doors. Welcome to the Centre for Biotechnology & Bioinformatics (CEBIB), College of Biological & Physical Sciences (CBPS), University of Nairobi. (biotechnology & Bioinformatics) in the academic year 2005/2006. This award was to conduct research work in the East African Region ( Kenya , Tanzania and Ethiopia ) on probability and possible consequences of gene flow from cultivated rice to their AA genome wild relatives. Information will be useful in future evaluations of possible impacts of introduction of genetically modified rice in the region. 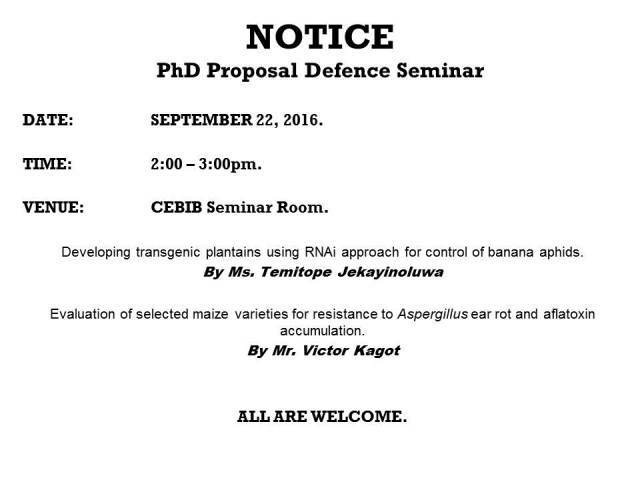 Department of Crop Protection, University of Nairobi. Bioprospecting for microbial metabolites for the control of important diseases of some vegetable crops. Biofertilizers for cereals and forage grasses. Ongoing Biofertilizers for cereals and forage grasses.